DUE SASSO (AUS) (Bay 2003-Stud 2007). 2 wins at 2, MRC Blue Diamond Prelude (c&g), Gr.3. Sire of 178 rnrs, 98 wnrs, inc. SW Red Ora (WATC Magic Millions Perth 3YO Trophy, RL, Dueton, SP Madassa, Silver Trace, Benito, Rikioh and of Our Memory Girl, Sass 'n' Glam, Foxalicious, Sasso's Circus, Royal Inferno, Kemilee, Paratonnerre, Screaming Plum, Detente, Zeinite, Aunty Zelma, Brackets, Hartley's Hope, Jaspara, Jewel Sasso, Wicked Hunter, etc. RED ORA (g. by Due Sasso). 10 wins. See below. Trisasso (f. by Due Sasso). Placed, 2d WATC Westspeed H., 3d WATC Westspeed H.
Coughlin's Law. Winner at 2100m, WATC Banksia Capital H., 2d WATC Tabtouch.mobi H., 3d WATC Westspeed Stayers' Bonus H.
SCENIC BLAST (Scenic). Horse of the Year & Champion Sprinter in Australia in 2009. Champion Older Sprinter in GB in 2009. 8 wins-1 at 2-to 1200m, £170,310, US$81,199, A$1,678,400, VRC Lightning S., Gr.1, Newmarket H., Gr.1, Royal Ascot King's Stand S., Gr.1, MRC HDF McNeil S., Gr.3, WATC Supremacy S., L, MRC Corps of Commissionaires H., WATC Alpine Wind Sprint H., Westspeed 3YO H., 2d Del Mar Bing Crosby S., Gr.1, MRC Caulfield Guineas, Gr.1, BTC Cup, Gr.1, WATC Karrakatta P., Gr.2, VRC Danehill S., Gr.3, WATC Perth S., L, BRC Coca-Cola Amatil S., WATC Walrus Sprint H., 3d VRC Coolmore Stud S., Gr.1, Hollywood Park Vernon O Underwood S., Gr.3, WATC Hyperion S., Gr.3, Oak Tree Morvich H., Gr.3, 4th MVRC Schweppes S., Gr.2, Hollywood Park Robert K Kerlan Memorial H., L.
GILDED VENOM (Golden Snake). 8 wins from 1200m to 2100m, A$1,131,985, WATC Railway S., Gr.1, CB Cox S., Gr.2, Asian Beau S., Gr.3, Herdsman Lake Tavern H., Medicine Kid H., Star Shot H., Superior Star H., 2d WATC Kingston Town Classic, Gr.1, RJ Peters S., Gr.3, SGIO Join the Movement H., Finish on Top with Fielders H., Perkal Group H., 3d WATC Motive Travel H.
RED BLAST (Universal Prince). 6 wins from 1300m to 2100m, A$382,261, Kalgoorlie Boulder RC Boulder Cup, L, WATC Westspeed Stayers' Bonus H., Brian 'Doc' Paddick H., Twitter.com Perthracing H., 2d WATC Perth Cup, Gr.2, CB Cox S., Gr.2, Coolgardie Cup, WATC LD Total H., 4th WATC Tattersall's Cup, L, Kalgoorlie Cup, L.
Elegant Blast (Blackfriars). 4 wins-2 at 2-from 1200m to 2200m, A$316,785, to 2017-18, WATC Pink Ladies Raceday 2YO P., Perthracing.com.au 2YO P., Apprentices' Cup, Amelia Park Lamb H., 2d WATC Freo Group H., Cavalier H., Seacorp H., Mumm Champagne H.-twice, 3d WATC Belmont Oaks, L, Schweppes P., Bunbury 3YO Classic, WATC Tabtouch Masters H., Iron Jack H., 4th Bunbury TC Western Australian Breeders' Classic, L.
HUISKES (Hussonet). 3 wins-2 at 2-to 1200m, A$85,930, TRC Elwick S., L, Alexandra 2YO P. (f), TTC Tasmanian Breeding Industry H., 2d TTC One Thousand Guineas, Alfa Bowl 2YO P., TRC Mortgage Solutions Tasmania 2YO H., 3d TTC Gold Sovereign S., L, TRC Midway Point Tavern 2YO H. Producer. Daughter's Charm (Delgado). 6 wins. See above. ORANGEADE (Otehi Bay). 7 wins-2 at 2-to 1200m, NZ$79,472, CJC Stewards' S.H., Gr.3, Edward Lumley H., L-twice, 2d CJC Pegasus S.H., L, 3d CJC Stewards' S.H., Gr.3. Producer. QUALITY KINGDOM (Kingdom Bay). Second top colt on The 1997-98 NZ 3YO Free H. 13 wins-2 at 2-to 1400m, NZ$195,325, A$234,300, Hawke's Bay Guineas, Gr.3, Qld Tatt's RC Mercedes-Benz S., Gr.3, 2d Wellington Guineas, Gr.2, 3d Levin RC Bayer Classic, Gr.1. Race Record: 35 Starts 10-5-4 A$657,300. 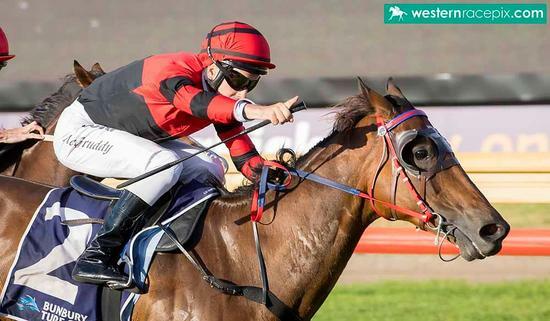 10 wins to 1400m, A$657,300, to 2017-18, WATC Magic Millions Perth 3YO Trophy, RL, Scenic Blast S., L, Bunbury S., L, WATC Westspeed 3YO H., Mt Barker TC Mungrup Stud Sprint H., WATC Westspeed H.-twice, Hyperno, Kingston Rule & Let's Elope H., Tabtouch H., Tabtouch With Cash H., 2d WATC Cyril Flower S., L, Grandstand Cup, L, Pinjarra Classic, L, WATC Westspeed 3YO H., Westspeed 3YO H., 3d WATC Grandstand Cup, L, Kalgoorlie Boulder RC Hannan's H., L, Pinjarra Classic, L, Mt Barker TC Mungrup Stud Sprint H., 4th WATC Cyril Flower S., L, Scenic Blast S., L, Bunbury S., L.